Today we are feeling blue; from Cobalt to Cerulean, Lapis to Azure, Indigo to Aegean and everything in between. There is a shade for every mood. Below are just a few inspirations that show you can never go wrong with blue. 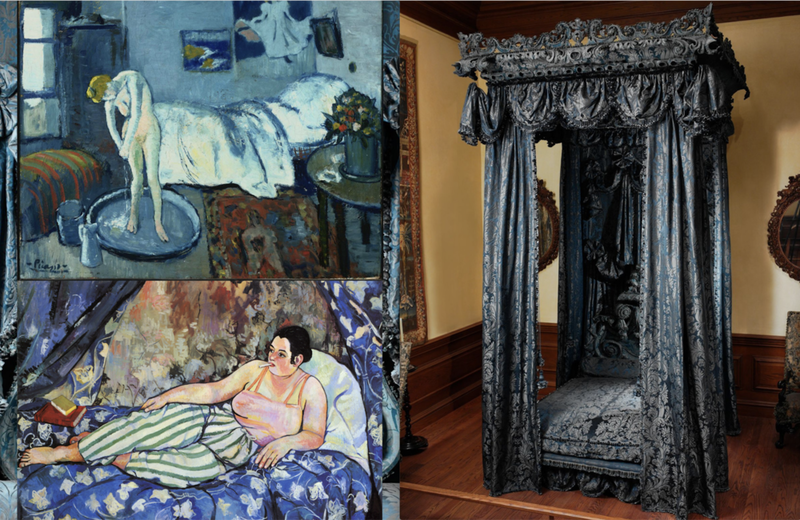 clockwise from top: The Blue Room by Pablo Picasso, State bed for Hampton Court, Herefordshire 1968 and The Blue Room by Suzanne Valadon. Tory Burch’s gorgeous home sits above a crystalline bay on the Caribbean Island of Antigua but the views from inside are what most caught our attention. Originally restored in the 1960’s the furniture was slipcovered in hand printed cottons and the beds adorned with floral canopies. The resulting “shabby chic” look is far more chic then shabby and we love the playful prints and patterns found throughout this dreamy pad. Lee Radziwill's impeccable taste is well documented. Her classic style and elegance extended beyond her wardrobe and her work as an interior designer showcases a penchant for the playful with striking prints, lithographs and paper lining the walls. This week we are especially inspired by Lee's own apartment and it's biological bent. Diana Vreeland, who over the course of her long career served as both fashion editor at Harpers Bazaar as well as Editor and Chief at Vouge, was a true original. Her aesthetic was provocative, eclectic and magnificently bold. She once said, in reference to the inspiration for her apartments interior, "I want my apartment to look like a garden: a garden in hell!”. This week we pay tribute to an icon and her singular style. 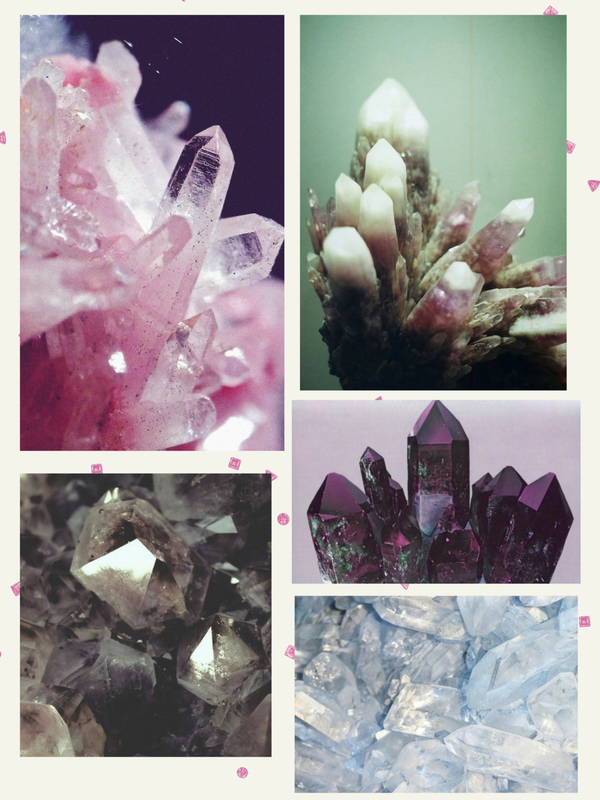 This week we've been feeling inspired by gems and geodes. These gorgeous crystalline structures and shades are grabbing our attention and reminding us the most beautiful creations are often natures own. These walls have big personality. We just love a unique room that feels true to its inhabitants, and we think our papers bring the same kind of pop to any wall. We're daydreaming about the folks who live in these rooms and wishing we could have a chat with them about their style! We're all about walls that make a statement. We love pattern and color to spice up a room, but sometimes the best type of wall is totally clear– especially when it's coupled with a great view. Today we are thinking about the power of windows to bring nature right into your home. These picturesque windows all create their own kind of wallpaper effect, anchoring the room and adding depth to the space. Our Dorado fabric in Peach looking oh so fine. A perfect textile for summer! This Mexico City studio, featured recently in the NY Times, is too dreamy. The photographer Graciela Iturbide commissioned her son to build her new studio, giving him only one condition: it be made of brick. Her son followed that direction closely, using four kinds of brick to make the structure. The result of the classic adobe color and the rich wood, lit by huge glass windows, is stunning. Our Dorado fabric would look right at home with this design scheme. We wouldn't mind working in here! We are featured in HGTV's June magazine! Spot our Tapestry Wallpaper in Zuni accenting this design savvy Texas home. Adam Talianchich and Ashley Menger build unique and beautiful homes for a living with their company Hatch Works, so it's not surprise that their house is so awesome. We're glad we could be a part of it. Thanks for the love, guys! 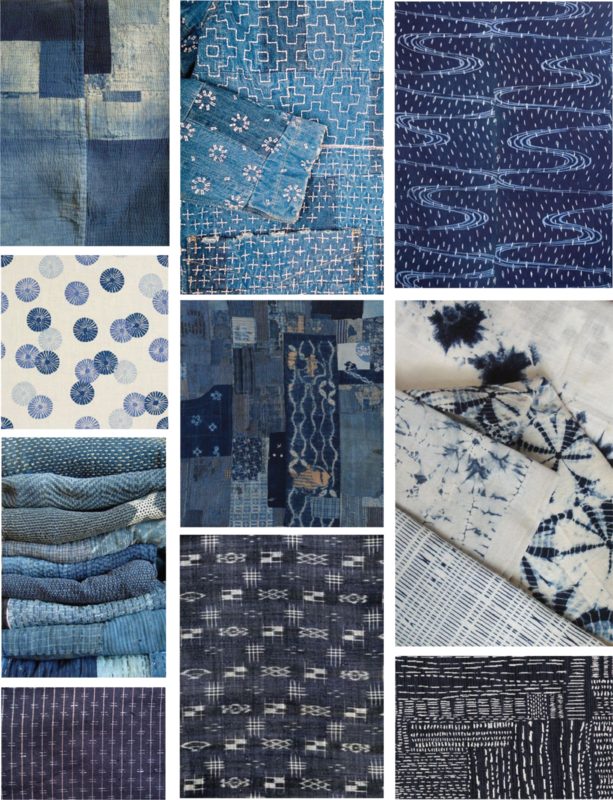 Dreaming of Japanese indigo! As summer approaches here at our studio by the beach, we are craving the cool of this ocean blue. This indigo, typically known as "Japan blue," is achieved through a centuries old dying process called Ai-zome. Traditional stitching and dying techniques like shashiko and shibori add beautiful details to this richly colored fabric. 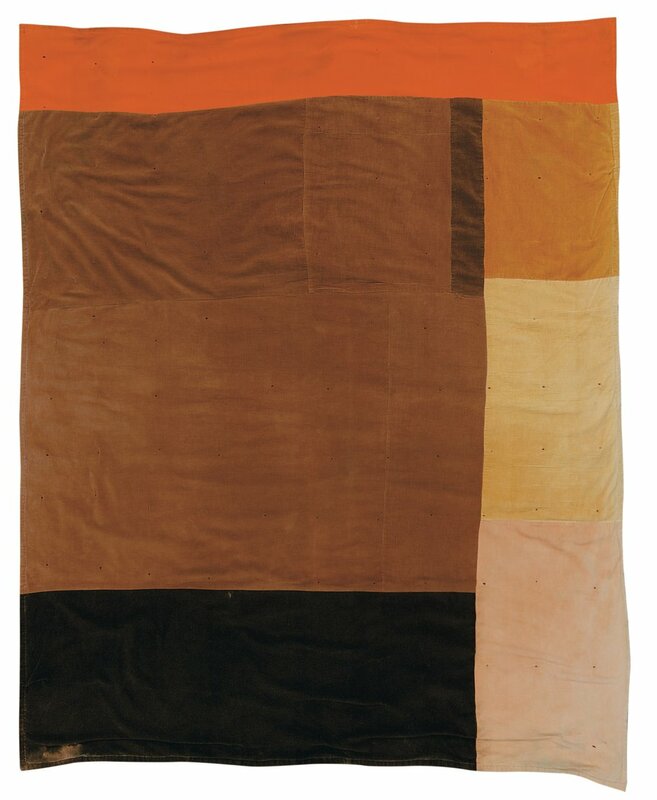 Today we are taking inspiration from the quilts of Gee's Bend. Gee's Bend is a small, rural community in Alabama where African American women have been making quilts since the 1920's. 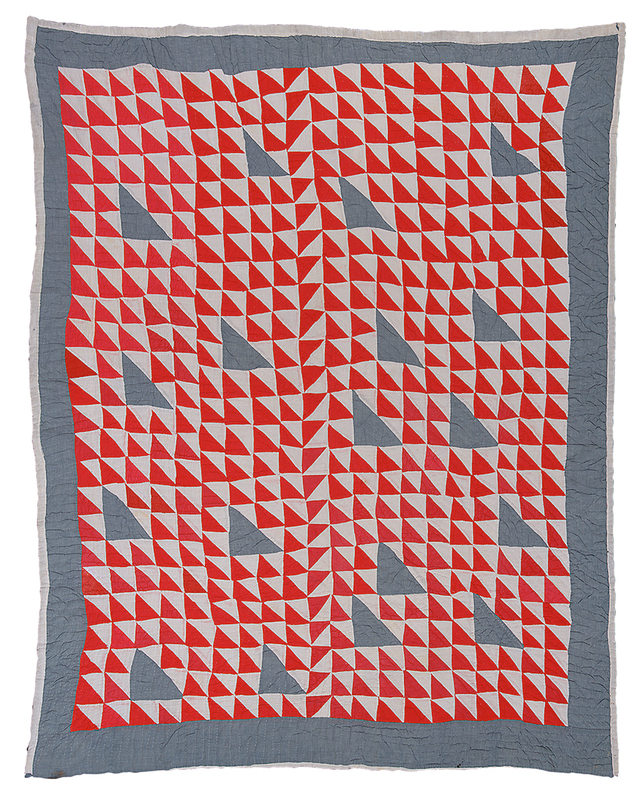 The art of quilt making has been passed down from mothers to daughters– often quilt makers exist in three or four generations of the same family. The geometric shapes, color schemes, and uses of abstraction and improvisation are striking. We are loving these bold colors and patterns. Ever wonder what our wallpaper would look like in your home? Here are some awesome examples of Cavern wallpaper out in the world! Pictured below are stylings of our Tapestry pattern in Zuni. It's one of our best sellers and we think these rooms show why! Our new Dorado fabric is here just in time for spring and we couldn't be more excited! Featured below is Dorado in Sage, a cactus green on natural linen with tones that echo the desert after rain. Head to our shop to see two more color ways, Indigo and Peach. Wallpaper is not just for walls! A beautiful paper is a great way to make a ceiling pop, and statement ceilings are taking off in 2018. In fact, according to Elle Decor, Pinterest pins for “statement ceilings” were up 310% this year. 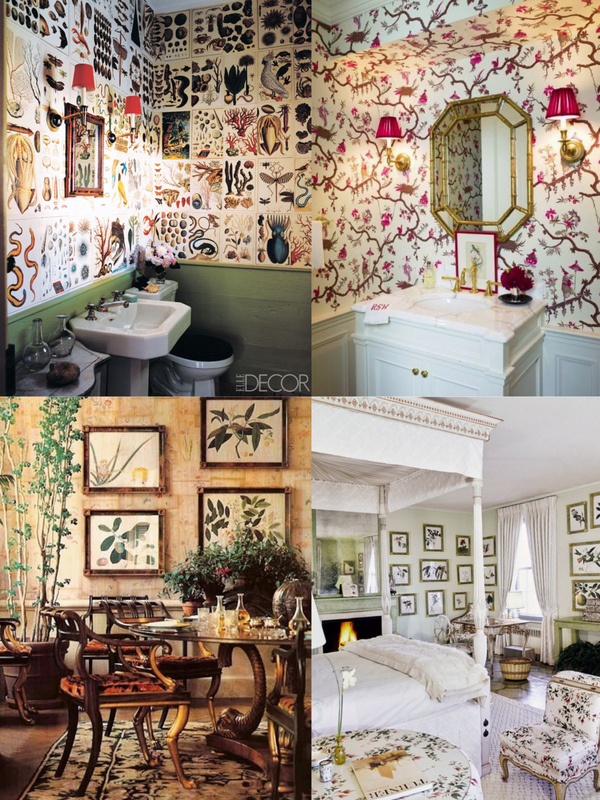 Here are some rooms that caught our eye...we'd love to see some Cavern papers on your ceilings! Even though emerald is the birthstone for May, the upcoming month has us thinking all about green! We've got our eye on emerald accented interiors and home goods, reinventing a classic, opulent look with a modern edge in materials like velvet and marble. Another great way to luxe up a room with emerald? Our Triple Gem wallpaper in Jayasaro, featured below. A California inspired valentine for all those who love Cavern. We love you too!